The wristband looks splendid, but the accuracy of measurement is apparently crappy. According to the above link, finger tip works the best (Samsung Galaxy S5). Performance wise we can say: finger tip > chest strap > wristband. Wristband is is most wearable. Unless you are planning on doing intense workout chest strap seems inconvenient. Getting further into it will just be a waste of time. Thus I'm going to ignore how pretty each things are and get into how each things will be implemented (if we start getting into how to make things more prettier, we will be creating super thimble at some point). It calculates heart rate using the change in reflectance of light source as blood pressure changes. There are plenty of cases relating to this on the internet. Apparently all the batteries will be used by IR LED. In normal condition we should constantly increase the measuring rate, and in abnormal condition we are in emergency state anyways. In that condition battery should not be the problem, thus let's assume that we are going to measure constantly. Due to problem with battery we will have to use Bluetooth Low Energy (BLE), which only has 10 m long output power ( it will decrease even more because we are using PCB antenna ). Depending on the situation we might have to use 2 APs. The protocol will be MQTT-SN. If we want to use Bluetooth to keep 24/7 watch, it will be impossible to use same battery for months. Henceforth, when we are picking elegant design while increasing the volume we can use Lithium Polymer (Li-Po) battery. Or even later on when we are mass producing we can customize the battery shape so that it fits into the case ( This is the ultimate goal ). Two set of heart rate monitor should be one package, so that when one is being used the other can be charging. Then it should contain a LED light that will let you know when the charging is needed. 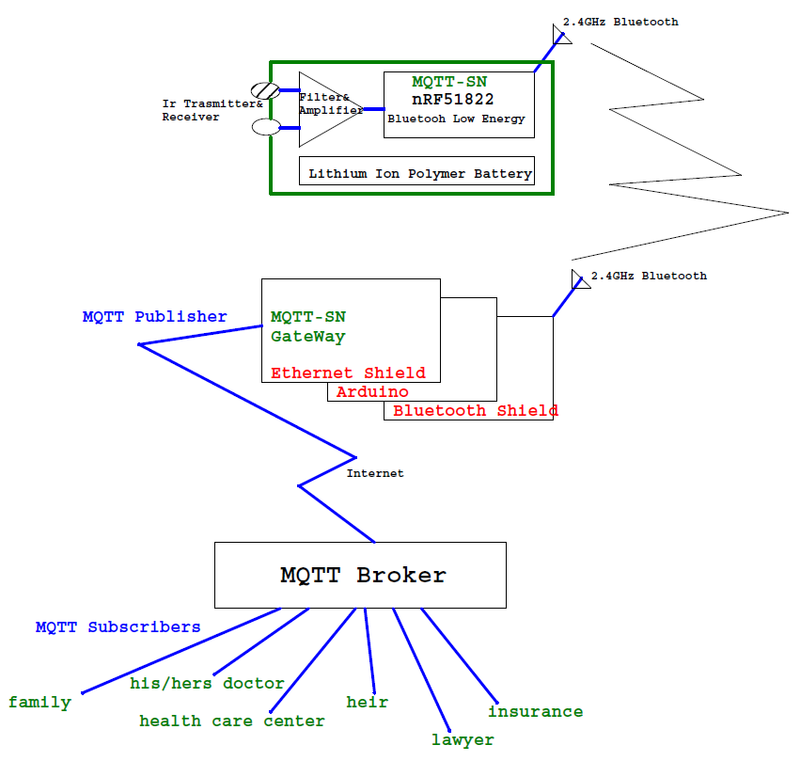 I'm going to use MQTT, because I don't need to build separate Service Server. People who have huge interest in someone's heart can just register as subscriber to the broker. If there is problem, Broker will send an e-mail or SMS immediately. If there is no message, you could ask Broker. However, the most simple way will be to call the person directly.